Sometime last year, I came across this fabulous woven basket tutorial HERE, written by Laura Canale. I made a mental note to try it out one day. I needed an idea for the Verve Easter Project Parade and thought it would be perfect. 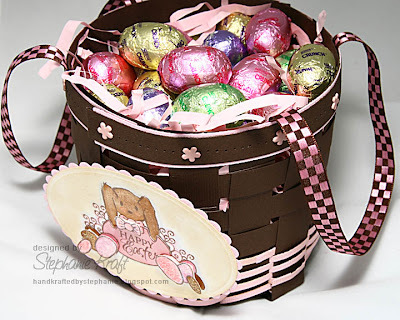 I used brown and pink cardstock to make a two-toned basket. The top strip is finished off with brads and piercing. 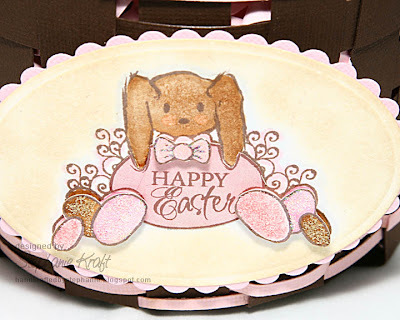 I used Verve's Chocolate Bunnies stamp set for my image and sentiment. I first stamped the bunny, then I colored her and paper-pieced the large middle egg and stamped Happy Easter on it. I stamped the eggs and her bow again, colored them, cut them out and popped them on top for some dimension. Finally, I added some Stickles for a little bling. Hope you're having a wonderful day! Thanks for stopping by! Accessories: Petite Oval Nestabilities (Spellbinders), Cuttlebug (Provo Craft), Markers (Copic), Star Dust, Cotton Candy and Antique Linen stickles (Ranger); paper piercer, ribbon, sponge dauber, brads, sticky tape, foam tape. You are amazing!!! This is so cute! What a great basket! Can I have some candy, lol? 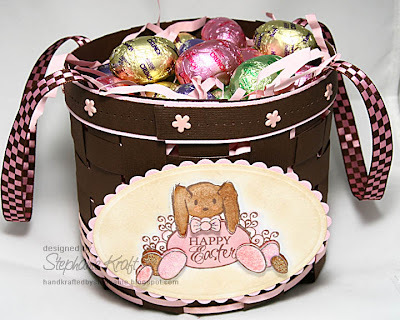 I LOVE this basket Stephanie!! I had seen the tutorial some time ago and have always wanted to try it!! You have totally inspired me! Great job!!! Wow Stephanie! So stinkin' cute! Fabulous job! Super cute box with fun chocolate eggs. Great job with the verve parade. Stephanie - this just blows me away - absolutely love it!!!! found you via the Verve parade!